Cleanliness is close to godliness, the old axiom says. While the saying has a lot of applications, one place that it is certainly true is in the business world. A clean establishment puts customers at ease and helps them to better trust in your employees. On the other hand, even a small coating of dirt is enough to alienate a surprisingly large number of potential customers. But for many small businesses, it can be hard to keep up with their cleaning needs. Sure, they can keep up with the day to day, mop and broom cleaning that needs to happen, but often times they are simply unequipped for the larger scale, more in-depth cleaning that is expected by the American consumer. Not only that but poor cleaning may lead to work place injury. 2011, 5.5 workplace injuries were recorded for every 100 warehouse workers. Often times, this is the direct result of their inability to get the proper equipment. After all, commercial floor scrubbers can be expensive. Even Used Floor Sweepers can be too bulky for some small businesses to store. Fortunately, many industrial cleaning equipment providers have started offering rentals to allow smaller businesses to have access to the very best in cleaning equipment without having to worry about the logistical headache of actually owning one. 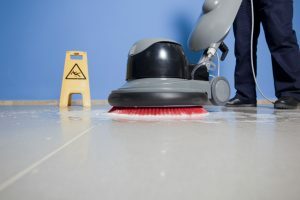 If you are one the fence about renting industrial floor scrubber and sweepers, we have a few reasons that might help make up your mind. Avoid tying up your capital:As mentioned, floor sweepers are a significant investment. If you are a newer or smaller business, even if you can afford the cost to purchase one, it might not be wise to put so much of your capital into a physical asset. Renting allows you the flexibility to achieve the deep clean your business needs without potentially affecting your cash flow. Avoid Maintenance Costs:Because the machine is owned by a third party, you do not have to worry about the slow erosion of the equipment that can create malfunction and ultimately depreciate its values. You can simply use a well maintained and functioning rental floor sweeper and then move on. No Storage Concerns:When you are running a small business every square foot counts (quite literally considering the way that most retail leases work). Don’t tie up any of that valuable space storing a machine that you will use once a month. Instead, you have the freedom to use the equipment when necessary but maximize your space otherwise. Small businesses are the lifeblood of the American economy, another cliche but none the less accurate. It can be hard to manage both your cleaning needs and the restrictions of space and budget. Rental equipment offers the best of both worlds.